The venerable Tulku Lama Lobsang Rinpoche is a high Buddhist master and renowned doctor of Tibetan medicine. 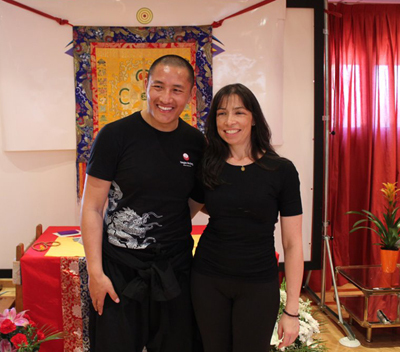 His teachings are based on the ancient Tantric knowledge that has been the foundation for Tibetan Buddhism, Medicine, Astrology and many other popular healing techniques. Having a deep knowledge of these disciplines, Rinpoche presents us with the wisdom of his lineage, integrating various studies into one, thus creating a comprehensive program of body movements to bring our bodies and minds into balance. Born in 1976 in northeastern Tibet, he entered the local monastic school at the age of six and at 13 was recognized as the eighth incarnation of the Nyentse Lama. Having already demonstrated an impressive affinity for the healing arts, Tulku Lobsang received intense studies in the foundations of Buddhist practices, Medicine, Philosophy and the teachings of Tantrayana. Tulku Lobsang travels the world offering seminars, workshops, retreats and medical consultations. His warmth and charismatic style are perfectly suited to the task of presenting ancient Tibetan knowledge to present day students. There is only one way to make your life happy, to be happy today. Because life is only today, never tomorrow.